Playing Space Cadets I learned two things: 30 seconds is a lot less than I thought and my hand-eye coordination is horrible when it comes to flicking coins to a specific target. In Space Cadets you take on the role of – surprise – space cadets. You and up to 5 friends play different officer roles on a spaceship: Navigation Officer, Engineering, Shields, Weapons and a few other which I didn’t really register as I was too busy panicking while the timer ran out. The game basically has two main phases: One where everybody tries to find a general strategy which – of course – happens in a very limited timeframe. And then everyone goes to their station and tries to implement that vaguely defined goal simultaneously. Every station has its own mini-game. I was Weapons Officer and had to fill different block shapes using a limited amount of Tetris blocks in order to load ammunition while my neighbor in Shields had to create poker combinations using chips of different colors in order to create shields of different strengths for the 4 sides of the ship. By a miracle we ended up winning the game… with the simplest mission… on easy… but it was great fun! 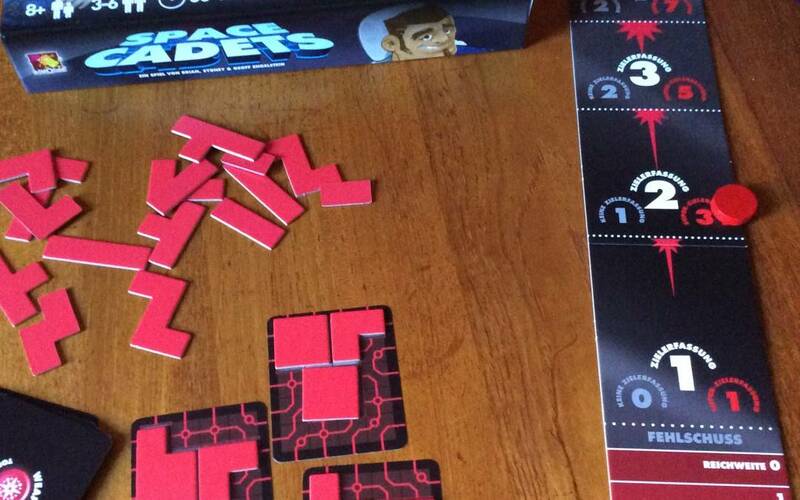 Space Cadets is definitely a game I would recommend to anyone who likes cooperation games. Then again, I generally don’t and I had a lot of fun.